UPDATE: After meeting the delegation from Parthala protest site today afternoon, Uttar Pradesh Chief Minister Yogi Adityanath stated that the dump site should be at a distance of 2 km from any habitation or residential area. He has also ordered a meeting tomorrow (June 19) with Noida Authority officials, MP, MLA and the protesting residents. 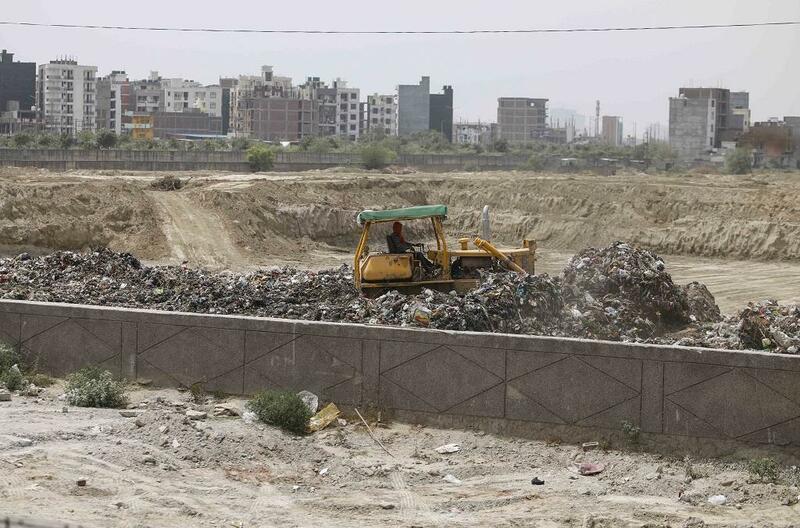 The residents of Noida’s sectors 117-122 are up in arms against a solid waste management plant of the Noida Authority in sector 123 since the beginning of this month. Multiple protests over the past two weeks culminated in a Mahapanchayat on June 17 when almost 130 people were detained by the local police and later released. As many as 3,000 people from neighbouring villages of Bahlolpur, Garhi Chaukhandi, Sorkha, Sarfabad, Parthala, and residents of high-rises like Ajnara Homes 121 and Gaur City had gathered at Parthala Chowk, which is opposite the waste dumping site in sector 123, to protest against the dumping of waste. But, dumping restarted at the site on June 14 despite the protests. People are concerned since waste is being dumped in the area without any infrastructure in place to manage it and that waste-to-energy plant has been proposed on the site which could adversely impact their health and the environment. The residents claim that many norms of the Solid Waste Management Rules, 2016, notified by the Union Ministry of Environment and Forests (MoEF) have been flouted by the authorities. For example, the dumping site should be at least 200 metres away from a residential area but it is closer than that. The site is also very close to the Hindon river floodplains, which means if the river floods it will wash the waste into the nearby areas. On May 29, the National Green Tribunal had ordered that waste dumping be stopped at a site in sector 54 after hearing a petition filed by residents’ welfare associations of sectors 22, 23, 53, 55 and 56. The order also said that the waste should now be dumped at the sector 123 site. When this order led to dumping in sector 123, people began protesting. Currently, there is no infrastructure for solid waste management or a waste-to-energy plant at the 10.12-hectare site in sector 123. All of it needs to be built. 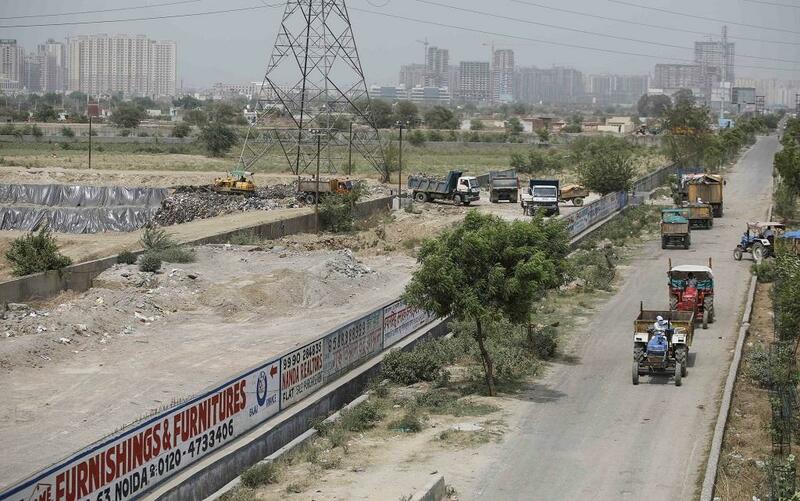 In a public notice, published in news papers on June 15, the Noida Authority clarified that the site in sector 123 is not a waste dumping site but a Sanitary Land Fill (SLF) site, according to the Noida Master Plan 2031. The authority had also assured the public that the waste was being temporarily brought there, but will be processed scientifically by building a Remediation Plant. On the other hand, in a letter dated September 14, 2016, written in response to A Right to Information (RTI) query filed by a resident of Ajnara Homes 121 society, an official of the Noida Authority had clearly said that there are no plans under consideration or been proposed for any kind of landfill site in sector 123. It further said that although the site was part of the Noida Master Plan 2031, but since it was not in line with the required environmental parameters it was being cancelled. The site had to be shifted to Astoli village in Greater Noida, according to the letter. The residents claim that they had bought houses in societies around the site because the plan for a landfill had been cancelled. “We want the plant to be removed from here and shifted to Astoli village which has already been identified by the authority,” says Neeraj Prakash, a resident of Ajnara Homes 121 society which is right in front of the dumping site. He claims that 1-1.5 lakh people in the residential societies and villages will be affected if the dumping site stays there. The locals claim that the shift is not being done as Astoli is 14 kms away and that would mean a lot of money would have to be spent on fuel. “But our health is more important than their money,” says Jile Singh who works as an advocate at the Surajpur district court and resides in Bahlolpur village, not far from the dumping site. Prakash is also afraid that since waste-to-energy plants have failed everywhere else in the country, this will not work either. He cites examples of Lucknow, Kanpur and Okhla. In such a situation, the site will end up as a dumping site creating a slew of problems for the residents, said Prakash. The residents have now formed a Kooda Ghar Virodh Sangharsh Samiti headed by Sukhbeer Pehelwan, a wrestler who resides in a nearby village, and plan to protest against the dumpsite. “We will protest until dumping at this site stops completely and a healthy environment for residents is ensured,” Pehelwan told Down to Earth. Should India impose anti-dumping duty on solar cells?